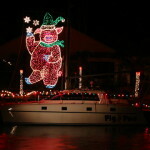 Boater Information – THE SATURDAY NIGHT BEFORE CHRISTMAS EVE BOAT PARADE – The Biggest Annual Event in the Isles ! Welcome to the most interactive, fun and spectacular display of Christmas Spirit on the Gulf Coast ! 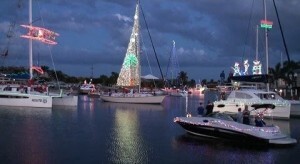 Punta Gorda Isles Christmas Boat Parade has become a time honored community tradition. Spectators, folks who live along the parade routes and boaters all arrange their holiday schedules to take part in this wonderful home town spectacle of joy, warmth and festivity, and to share the spirit of the season with our community. UP CLOSE AND PERSONAL ! 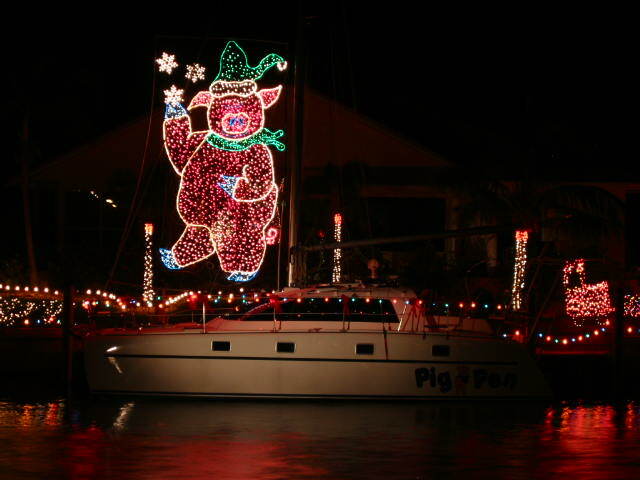 Four miles of 100′ wide protected canals lined with enthusiastic spectators 50′ away, cheering on boats decorated with lights, music, action and sound and most importantly, the essential human component of the interaction between the crews and spectators are he essential ingredients that make this parade so very special. The beautifully decorated boats and homes along the parade route are just the icing. Being on a boat provides your crew the advantage of enjoying four miles of cheers, beautifully decorated waterfront homes and lots of beautifully decorated boats, many with carolers, dancers, musicians, singers or other action. Simply put; the Boaters are there for the cheering spectators, who are there to support, share and enjoy boaters’ show in the spirit of the season. 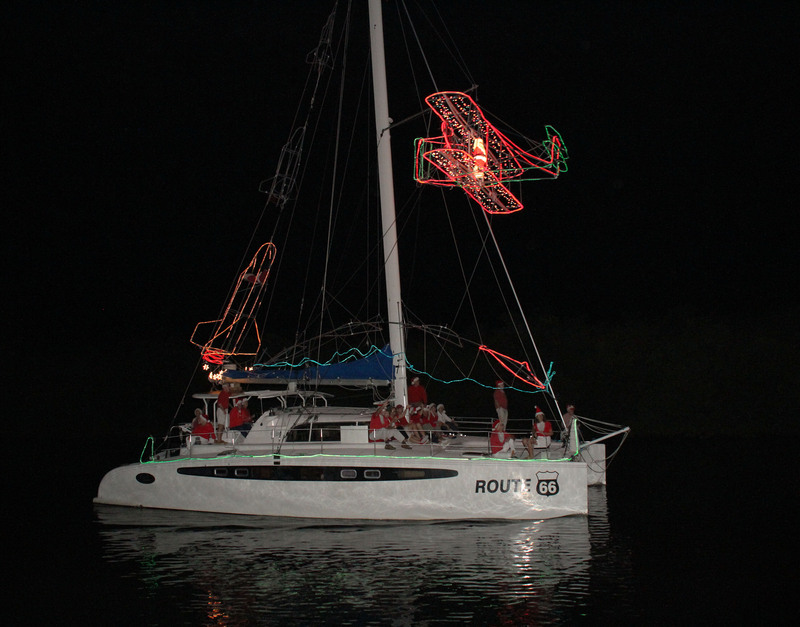 Simple decorations and lights are just as welcome as the ornate, and with a bit of planning, a boat can be nicely decorated in one day. We can show you how at the Free Decorating Workshop, or simply take a look at our DECORATING TIPS page for more information. Well decorated, silent boats with stoic crews will not elicit the crowd’s enthusiasm as will the boats full of people having fun with music and enthusiastic carolers a musician, or dancers with everyone wearing a costume. Something as simple as matching elf hats will wow the crowd. Musical instruments TALENT CONNECTIONS a stereo or a simple boom box with “D” size batteries for music with sound specifically aimed at the crowd will also elicit cheers. Your onboard crew will have a great time and as the Captain and host, you get to provide your crew with a view of all the other boats, and the sight of all the gaily decorated homes together, reflecting on the water. This makes for an event your guests will not ever forget. Spectators bring sleigh bells, cow bells and noisemakers, give them a reason to applaud, cheer and make a joyful noise. REQUIREMENTS: All boats, whose overall length is greater than 18’ who can make 5 kts are welcome. For safety reasons, no kayaks, dinghies, canoes or self propelled vessels will be accepted. 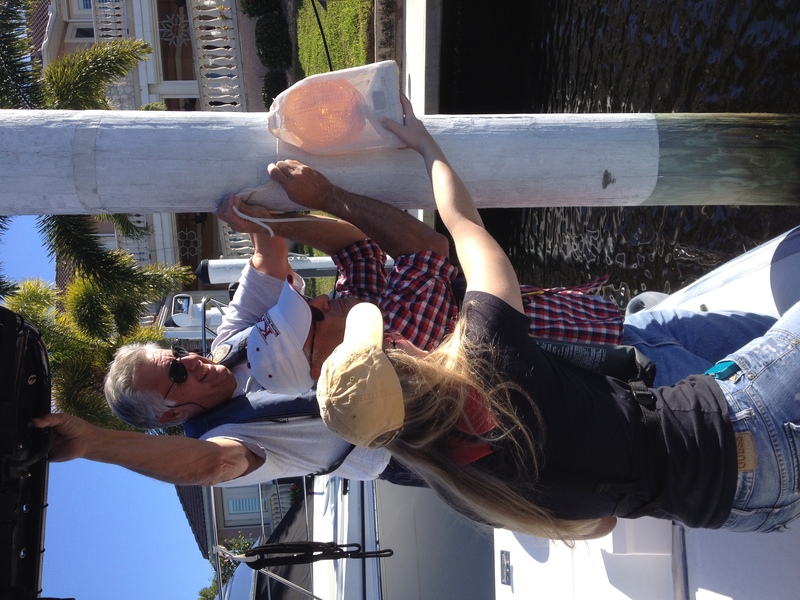 OFFICIAL SIGNBOARDS REQUIRED: ALL PARTICIPATING VESSELS ARE REQUIRED TO DISPLAY OFFICIAL LIGHTED SIGN BOARDS, provided by the Punta Gorda Isles Community Association. On Water Law Enforcement will be actively issuing citations to vessels obstructing or motoring in the Parade route. Signboards will be distributed at the e Mandatory Captains Meeting. These must be affixed to your boat so they can be seen from the front, sides and aft. 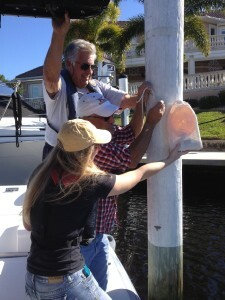 Now parading boaters will can easily follow the well marked participating boats. Your friends on shore can look through the extensive colored lights for your number and be ready to greet you enthusiastically. If some unmarked boat barges into the parade, it will be easily identified to on site law enforcement officials. NON-COMMERCIAL: Commercial or political displays, banners, audio or signage is not permitted. Charitable organizations, non-profits and local service clubs are welcome. The boat ramp at Ponce Park is available for trailered vessels, however it should be noted that THE PARK CLOSES AND IS LOCKED AT SUNSET. Punta Gorda Police Department will unlock the gate for the retrieval of REGISTERED PARADE VESSELS ONLY, however it will require a telephone call to the non-emergency number 639-4111. THIS APPLIES ONLY TO REGISTERED VESSELS, NOT THOSE BOATERS VIEWING THE PARADE. PROJECTILES: No candy or other objects are to be thrown or otherwise distributed to or from the crowds or boats. DOCK SPACE: is available for registered boaters both before and after the parade. No need to travel in the dark. You can arrive a day or so ahead, and leave a day or so after the parade. Dock space is based on availability, so make your arrangements now. Contact Harris Bowers at Forcefield Hurricane Protection Systems 941-625-2295 to make arrangements on a first come-first served basis. PARADE BASICS: The parade starts at dark about 6:00 PM on Saturday. First time Paraders not familiar with the PGI canal system should consider doing a dry run before the parade, with the printed Parade route on board. There are two ways to travel to the Parade start. You can arrive from the west and enter through Ponce inlet, with the advantage of no bridges, or come in from the north via the Tarpon Inlet canal running north/south along side of Colony Point Drive, under the Marion Avenue bridge, with an approximate clearance of 13′ 6″. As you enter PGI from Ponce Inlet intersection, the first canal south is the rim canal. Follow the route chart to the Albatross assembly area. 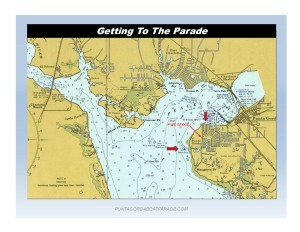 It’s a good idea to print this page of BOATER INFORMATION as well as the PARADE ROUTE to take along with you. COMMUNICATIONS: Parade communication is on Channel 72. The Punta Gorda Police patrol boats also monitor 72 and 16. ASSEMBLY & PRE-PARADE: The Parade assembles in Santa’s Cove and the other adjoining canals. There are docks available under control of the Parade Dockmaster who communicates on Channel 72. 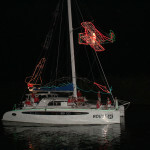 Many boats will tie up at docks, anchor in Santa’s Cove, or raft up with friends well ahead of the Parade start. Rafting boats supply lines and fenders. Be careful of decorations. Many participants arrive early and raft up to meet and greet and share hors d’oeurvres and an eggnog with friends. If you have no onboard “head” this is an opportunity for you and your guests to share someone else’s, however prior arrangements are a very wise idea. sailing catamaran, with a 24 foot beam. We’ll announce the last boat for the 2018 Parade soon. The Lead Boat – JOY, the last boat and THE GATEKEEPER boat will be announced at the mandatory captains meeting on December 19th at 7:00 PM. Boats can queue up beginning at at 6:00 PM behind the lead boat JOY and will take direction via channel 72 from the GATEKEEPER. Be sure to get in ahead of the designated last boat (to be announced). Just queue in behind any boat that suits you, and make certain to be on VHF channel 72 with your signboards visible to the GATEKEEPER. SPACING: There should be a minimum one building lot spaces between each boat, about 100 feet. This is so important to avoid gaps and the accordion effect. There should be a minimum one building lot spaces between each boat, about 100 feet. It’s so important, we’ve said it twice. Give the spectators time to see and photo your boat. It is critical to keep the boat in front of you in sight at all times as we don’t want spectators to think the parade is over. If a large gap appears between you boat and the preceding vessel, do not speed up too quickly to close the gap. This would cause an accordion effect and would soon mean some boats would come to a stop. The parade moves at just enough speed to maintain steerage and will never exceed 4-5 knots. At the turns, boats do slow down, however they soon catch up at a slow speed, as all the boats will be slowing at each turn. MINIMUM SPEED TIP: Vessels with twin engines can run slower. Simply leave one engine in neutral and apply a bit of rudder to stay straight. Straighten the rudder and engage both engines to better negotiate a turn. TURNS: Other than the obvious gentle turns, all turns feature flashing red arrow markers. Prior to the Parade, blinking yellow caution markers are set out on certain dock pilings or any other hazards that may not be easily seen in the dark and close to the right of way. ROUTE: The route leaves the assembly area and proceeds to ultimately end in Yellowfish Lagoon. The Parade ends in a grand Parade Circle, where all the boaters have the opportunity to see all the other boats. Proceed counterclockwise around the lagoon playing to the crowds. Police will block the return canal to Ponce inlet to allow for the safe passage of the larger larger boats into Yellowfish Lagoon. Police will not allow passage back out of Yellowfish, toward the Ponce Inlet until the last boat has entered Yellowfish Lagoon. LEAVING THE PARADE ROUTE: In the event you need to leave the parade route for an emergency, equipment failure or other reason, PLEASE TURN OFF your decorative lights & identification signboards so others will not inadvertently follow you off the Parade route. SPECTATOR BOATS: Every year more spectator boats visit the Parade route. Law enforcement will be actively issuing citations to those anchoring in or motoring about the Parade route, however, watch for anchor lines and be vigilant and aware that they may show up at any time, tied to a dock, anchored or idling along the route. The only way to make a grand entrance is to leave a gap of four lots (300 feet) ahead of your boat. Following too closely makes your boat look like a freight car on a train. Do not stop the show to talk to friends, discharge or pick up passengers. WEATHER: The parade will go on unless canceled by Parade Control on VHF Channel 72 and by e-mail. Check the website for up to date information. The protected canals of PGI are not adversely affected by severe tides or winds. FINAL INSTRUCTIONS: The PG Police will be traveling the entire route on Wednesday to insure that there are no unexpected route problems. If necessary, last minute issues will be distributed to you on Friday by email. Be alert at the helm and maintain an adequate distance between yourself and the boat ahead. Leave the partying and drinking until you are back in the slip. Encourage your crew to bring sufficient warm clothing, as it can get cold quickly after sunset on the water. We strongly suggest printing a copy of this page and the parade route map to take along.